Happy Friday friends! I'm excited to finally get my grubby mitts on Chanel "June." It's such a pretty color without being gaudy. I generally stay away from oranges, but this is more of a soft apricot and a little bit of creamsicle. Have you tried June? What is your favorite spring polish? So pretty! 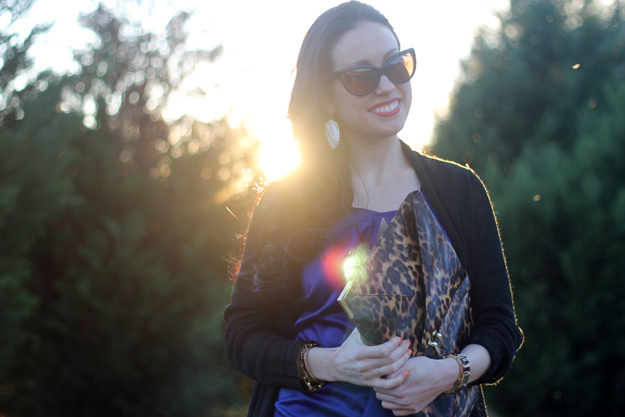 I love the oversized leopard clutch too. My nail polish lately is a bright orangey color that I've had on since Mexico. I need to switch it up soon, and have been thinking about getting the at-home UV gel kit from Ulta. My nails are pretty weak, and when I do a regular manicure on myself they chip within a day! 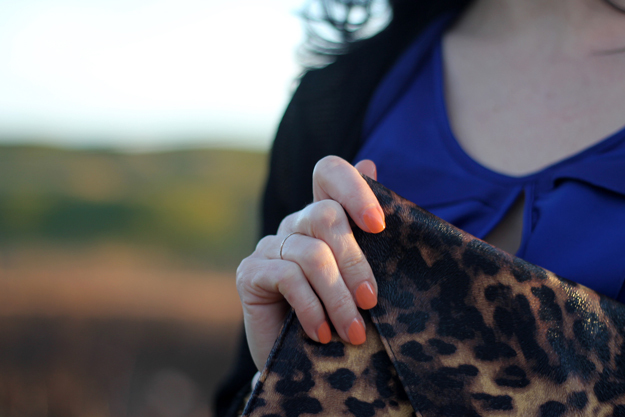 Your orange nails work really well with the cobalt! Beautiful color combo. Lately I am really digging mint polish and I want to get an aqua one next. Have a great weekend! Cute photos, and the purse is soooo beautiful!!! We really like those sunglasses you are wearing, fab outfit! Love the nail color ad that clutch is so awesome! Love the new nail polish! And those sunglasses look awesome too! Ps- Where were these taken? gorgeous!! 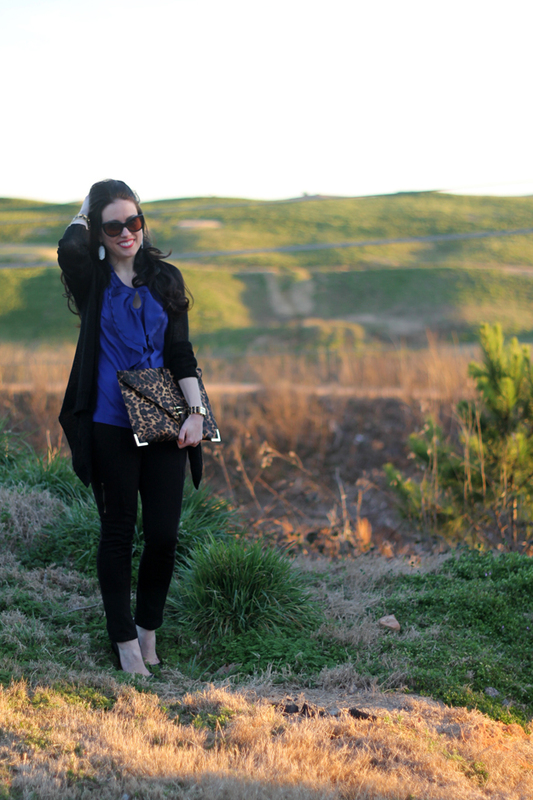 in love with your bag & sunglasses!! @Monique - they were taken near the golf course near my place! You look so chic!!! 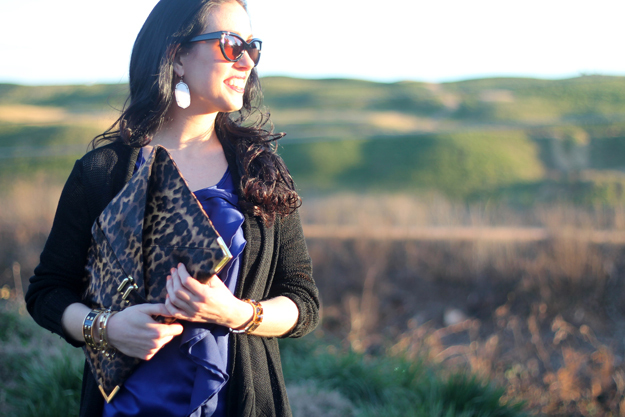 Love the clutch! Really cute outfit. I absolutely love the accessories, especially the purse. Really really nice outfit!!! i love your clutch!!! Gorgeous outfit! I love the photos! You look absolutely amazing. I love your clutch. P.S. We are having a giveaway for a personalized necklace on our blog. If you have time please stop by and enter. You look gorgeous !! The nail color so nice. My bottle is on it's way. I loved it when it was first introduced. I think that color would look great on everybody. Gorgeous backdrop Mary Ann. It's breathtaking. Love that color combo, and that nail polish! !